May 3, 2017 March 22, 2017 Eric Mortensen 0 Comments 1975, Judith Shepard Rosenfeld, Orda Industries Ltd. While some of the earliest board games have been lost to time, quite a few of these ancient games are still in existence to some degree to this day. We really haven’t looked at a lot of these ancient board games on Geeky Hobbies because games like Chess and Checkers have basically been played by everyone at some point in their lives. We have looked at Parcheesi (Pachisi) but I can’t really think of any other really old board games (100+ years) that we have reviewed. 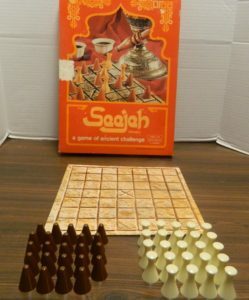 Today we are going to look at Seejeh which is a variant of the ancient board game of Seega whose origins have been lost to time. With the game being thousands of years old, I was interested in seeing if the game could still hold up today. While I can see a lot of promise in Seejeh, I found it to be too dull to put in the time needed to master the game. Players decide which player will play as the Tels (pointed pieces) and which will play as Jugs (curved pieces). To setup the board the player using the Tels places two pieces in any space other than the space in the middle of the board. The Jugs player will then place two of their pieces (also not in the middle). Players keep alternating playing two pieces until all of the pieces are on the board. Sometime during setup the Tels player has to place at least one of their pieces on one of the spaces next to the center space. The Tels player will make the first move. For the first move in the game the Tels player has to move one of their pieces into the center space. After the first move players will move one of their pieces horizontally or vertically to an adjacent unoccupied space. The Tels player moved their piece into the center space. They would capture the piece to the left and below the piece that was just moved. After moving a piece the player checks to see if they captured one of the other player’s pieces. A player captures a piece if the piece they moved sandwiches one of their opponent’s pieces between the piece that was moved and another piece belonging to the current player. If the player successfully captures a piece, they can move one of their pieces another space if that would also lead to a capture. The player can keep making moves as long as they lead to additional captures. The Tels player has moved a piece to the space to the right of the center space. This move would capture the Jugs piece above it. During a player’s turn they can choose to move one of their pieces in between two of the other player’s pieces. This piece is not captured and can only be captured if the other player moves a piece on their turn that would capture the piece. The Jugs piece has moved between two Tels. This piece cannot be captured by those two Tels unless one of the Tels is moved and then moved back to the same space. If a player has no where that they can move a piece or they would have to make a move that would lead to many of their pieces being captured, they can call for a blockade. 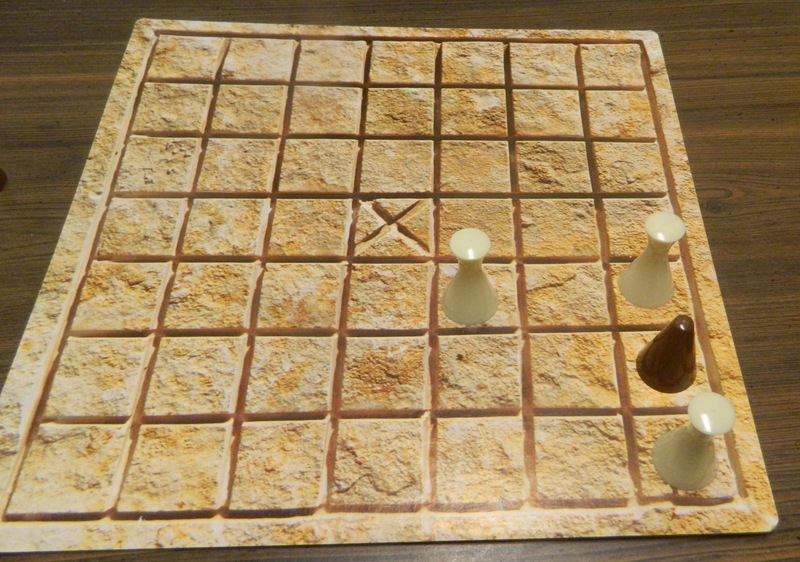 In a blockade (no matter who called it) the Tels player will remove two of their pieces from the board and the Jugs player has to remove one piece. 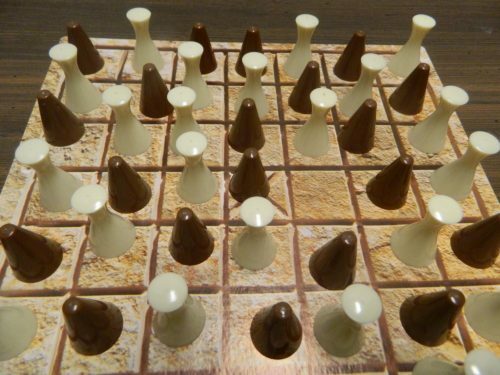 The players can remove whichever pieces they want as long as the blockade is broken by the pieces being removed. When one of the players capture the other player’s last piece, they win the game. The game can also end if one player has lost too many pieces that they would have no way of winning the game. The jugs player has captured the final Tels piece and has won the game. 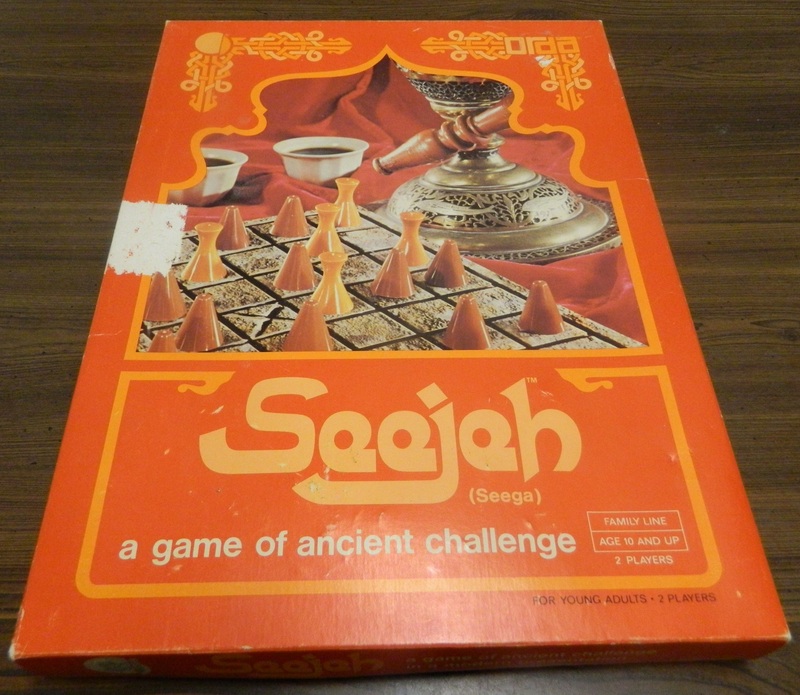 As I have already brought up Seejeh is basically a variant of the board game Seega and several other ancient board games that have used similar mechanics. In both Seejeh and Seega the players move pieces capturing the other player’s pieces when they have been surrounded by two pieces. The only real difference between Seega and Seejeh appears to be the size of the board since most Seega boards are 5 x 5 grids while the Seejeh board is a 7 x 7 grid. Just like with Chess I see Seejeh being the type of game that is easy to learn but hard to master. The game only takes minutes to learn but you will likely be destroyed by a more experienced player. Seejeh is the type of game that you have to play quite a few times before you can develop a good strategy. For your first games you basically are going to wing it hoping for the best. You will know what you are supposed to be doing but you won’t have the experience with the game to know how best to approach the game’s strategy. A good strategy is crucial in Seejeh because you could lose the game before you even begin. If you don’t have a strategy when you setup the board you are going to be in a lot of trouble. While I haven’t played the game enough to really form a good strategy, I can tell that the setup stage of the game is critical. Experienced players can gain a significant advantage in the game by doing a good job setting up their pieces. Inexperienced players will likely just randomly place pieces since they don’t yet know how to form a strategy for the game. This is one of the main reasons an inexperienced player is at a huge disadvantage in the game. As I can personally attest to, Seejeh is a game that you really have to pay attention to while playing. You have to look at every possible move before taking an action or you could easily walk into a trap. If you rush your moves you likely will miss things and lose pieces that you otherwise wouldn’t have lost. This leads to an analysis paralysis problem since you have to analyze all of your different options. With both players taking a lot of time analyzing their potential moves, this can really slow down the game. As a whole Seejeh takes too long. With so many pieces on the board there are so many different options to look at and a lot of pieces have to be captured before the game ends. This is one of the reasons why I think the other versions of Seega are probably better than Seejeh. 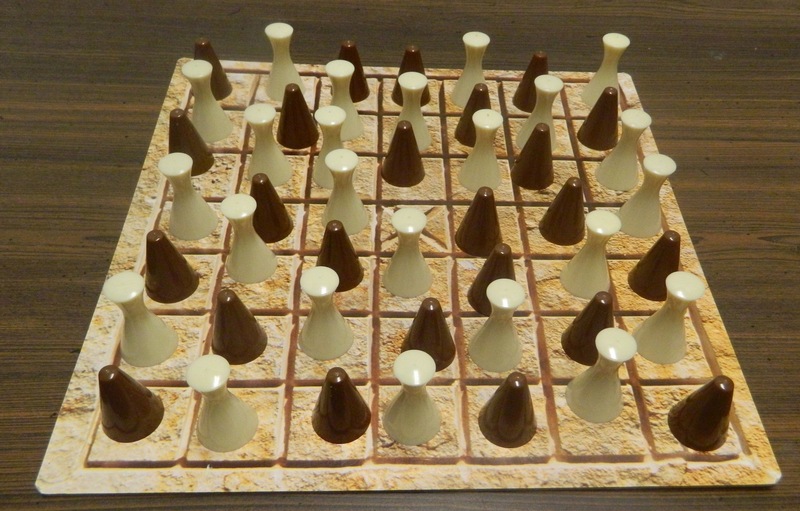 Most versions of Seega give each player 12 pieces while Seejeh gives each player 24 pieces. I personally think 24 pieces are too many and they drag down Seejeh. One thing I really didn’t like about Seejeh were the blockade rules. I understand why the blockade rules were added to the game but I don’t think they are fair. I believe the blockade rules were added to prevent stalemates/stalling which is a prevalent issue in the game. The blockade rules have a serious problem though since one of the players always loses in a blockade. While the Tels player has an advantage by going first, the Tels player always loses an additional piece in blockades no matter which player calls it. This leads me wonder why the Jugs player couldn’t just keep calling for a blockade since they will always come out on top of every blockade. While the Jugs player can’t help not being able to move, they could always use the reasoning that they will lose too many pieces if they move. Since there is no rule saying what is too many pieces to lose, what would stop the Jugs player from almost always calling a blockade on their turn? You have to put a rule in place on how many pieces are too many. While this probably isn’t a big problem for experts in Seejeh, I could see it being highly abused by new players. As I already brought up Seejeh has a serious stalemate/stalling problem. Early in the game players capture quite a few pieces pretty quickly. Once the board opens up though it is much easier to avoid the other player. If you have really stubborn players, they could move the same pieces back and forth trying to force the other player to make the first move. If both players are stubborn this could quickly lead to a situation where neither player wants to make a move. You likely will have to come up with your house rules to prevent these stalemate issues. While I can see a lot of people really enjoying Seejeh, my biggest problem with the game is that it is kind of boring. Seejeh is the perfect definition of an abstract game. The game has pretty much no theme as it is just a set of game mechanics. Seejeh and Chess share a lot in common but for some reason I like Chess and found Seejeh to be boring. I usually like abstract games but I just wasn’t feeling Seejeh for some reason. I am guessing the main reason is that Seejeh is the type of game that you have to get familiar with in order to fully appreciate. In your first games you likely will be winging it so the strategy doesn’t really come into play. The more you play Seejeh though the strategy should become clearer and I actually think you will start enjoying Seejeh more. I just didn’t get enough enjoyment out of the game to put in the amount of time that it would take to get to that point. Being based on an ancient board game it doesn’t really surprise me that the components for Seejeh aren’t very good. Since it was a public domain game any company could made their own version of the game and that is what Orda Industries Ltd did. Just like there are really nice and really cheap Chess boards, the same seems to be the case with Seejeh being on the lower end of the spectrum. The board is pretty thin, small and just cheap. 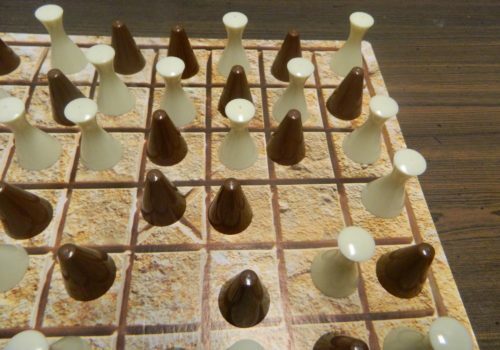 The playing pieces are your typical plastic pieces and are nothing special. Being a public domain game you could also easily make your own copy of the game. You just need a 7 x 7 grid and 24 pieces of one color and 24 pieces of another color. If you are interested in the game you could easily make your own version of the game to try it out before you decide to pay for an “official” copy of the game. I am really conflicted when it comes to Seejeh. The game has a surprising amount of strategy and kind of reminds me of Chess. If you don’t think through your moves you will lose the game pretty quickly. The more you play the game the better you will get at it. The problem with the game though is that it takes too long and it is kind of boring. Without a strategy the game is just not that enjoyable. To get a good strategy though you have to put in quite a bit of time into the game. I just didn’t enjoy the game enough to put in the time to fully grasp the game’s potential strategy. If you don’t really like abstract strategy games like Chess or Checkers I don’t really see you enjoying Seejeh since it can be kind of dull. 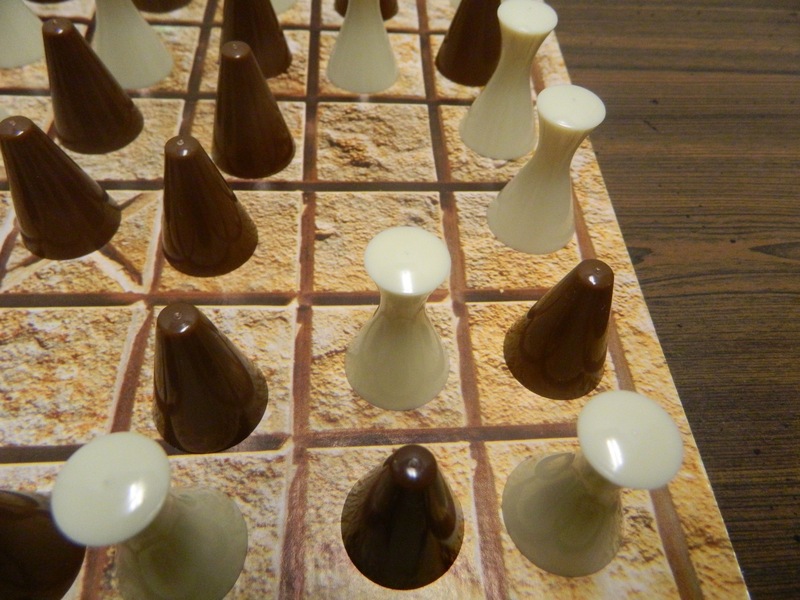 If you really like games like Chess though and would like to try something new you might really enjoy Seejeh. Easy to play but hard to master. Should get better the more you play it. Takes too long and has too many chances which creates analysis paralysis.